Taking care of technology before accidents happen keeps your students and your budget on-track. 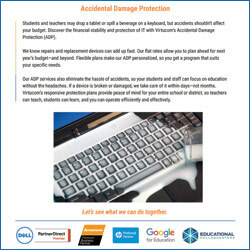 Students and teachers may drop a tablet or spill a beverage on a keyboard, but accidents shouldn’t affect your budget. Discover the financial stability and protection of IT with Virtucom’s Accidental Damage Protection (ADP). We know repairs and replacement devices can add up fast. Our flat rates allow you to plan ahead for next year’s budget—and beyond. 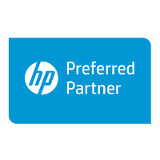 Flexible plans make our ADP personalized, so you get a program that suits your specific needs. Our ADP services also eliminate the hassle of accidents, so your students and staff can focus on education without the headaches. If a device is broken or damaged, we take care of it within days—not months. Virtucom’s responsive protection plans provide peace of mind for your entire school or district, so teachers can teach, students can learn, and you can operate efficiently and effectively. A broken device doesn’t need to bust your budget. Call one of our friendly experts today, and find the right protection for you.